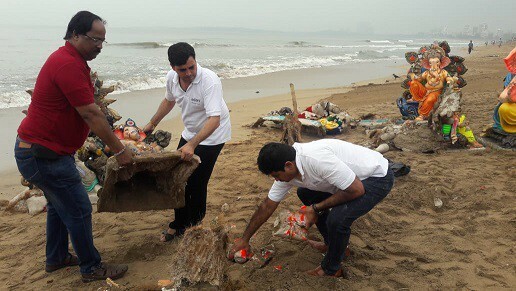 Mumbai, September 25, 2018: As an extension to the ongoing campaign for ‘Swachhata Abhiyan’, Adani Electricity Mumbai Limited (AEML) activated mega clean-up drive at the Juhu beach post Ganpati Immersion. Almost 100 AEML employees collected the waste that got washed back by the water, after the Ganpati immersions. This was done in a bid to make the beaches litter free. Caption for the photographs: Under the campaign for ‘Swachhata Abhiyan’, Adani Electricity Mumbai Limited (AEML) participated in mega clean-up drive at the Juhu beach post Ganpati Immersion. Almost 100 AEML employees collected the waste that got washed back by the water, after the Ganpati immersions.